An annexe apartment based near the village of Bleadon in Somerset, it can sleep two people in one bedroom. Homestead West Wing is an annexe apartment located near Bleadon in Somerset. It has one double bedroom with sitting area and open fire and a bathroom, it can sleep two people. Also inside there is a kitchen and a sun room with dining furniture. 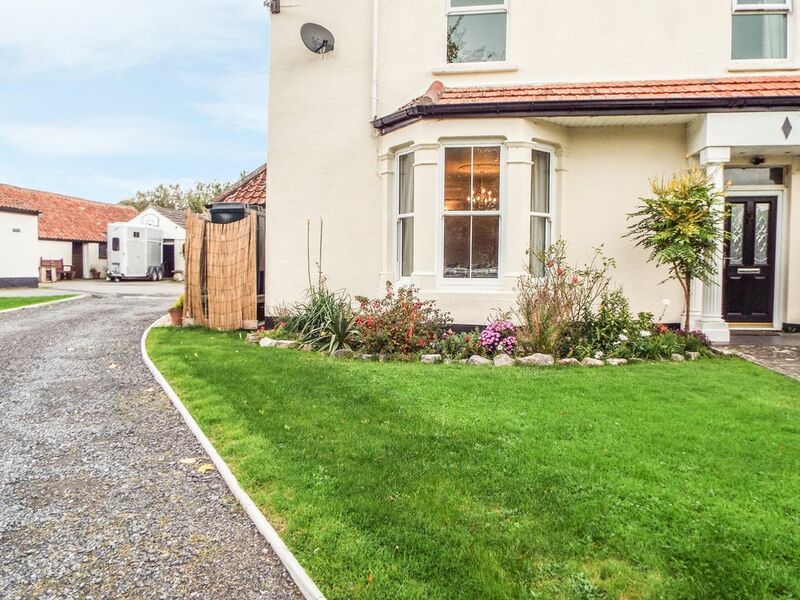 To the outside there is ample off road parking and a shared lawn with furniture. Homestead West Wing is a charming property in a great rural location. Amenities: Oil central heating with open fire. Combination microwave/oven, induction hob, fridge, TV, WIFI, selection of books and DVDs. Fuel, power and starter pack for fire inc. in rent. Bed linen and towels inc. in rent. Off road parking for 2 cars. Shared use of owner's lawned area with furniture. Sorry, no pets and no smoking. Shop 1 mile, pub 2 miles. Note: Adults only, no children or infants. Region: Somerset offers 3 Areas of Outstanding Natural Beauty - the Quantock, Mendip and Blackdown Hills. Lose yourself in the glory of nature, take a ride on a steam train, visit a traditional farmers market or explore your mystical side at Glastonbury. Town: A village on the fringe of the Mendip Hills AONB. Bleadon is an ideal base for a break, it has a shop, a pub and a farm shop with a café, it is also home to Bleadon Hill, an SSSI. The village comes with history as it is home to a Grade I listed 14th century church, there is also evidence of agricultural work dating back to the medieval period. Bleadon lies on the River Axe, once used as a port. There are good places to visit around Bleadon, close by there is Weston-super-Mare, as well as Brean. Further afield is Bristol, as well as Glastonbury which boasts architecture and is home to one of the biggest music festivals in the world. All ground floor. One double bedroom with sitting area and open fire. Bathroom with shower, basin and WC. Kitchen. Dining room. Oil central heating with open fire. Combination microwave/oven, induction hob, fridge, TV, WIFI, selection of books and DVDs. Fuel, power and starter pack for fire inc. in rent. Bed linen and towels inc. in rent. Off road parking for 2 cars. Shared use of owner's lawned area with furniture. Sorry, no pets and no smoking. Shop 1 mile, pub 2 miles. Note: Adults only, no children or infants.